One of the most common mistakes that newer golfers make is they tense up and become too rigid when getting down to a shot. This is usually due to nerves or trying to hit the ball too hard. It’s important that you relax as you get down to play a shot, whether it’s a tee shot, a pitch to the green or a putt. Knees slightly bent, back straight (but not rigid) and head up and turned slightly to the right (left, if you’re left-handed). Your feet, hips and shoulders need to be in line with the line that you want the ball to travel and the position of the ball between your feet depnds on the club you’re using, as shown in the image. With a driver, the ball wants to be in line with your left heel and further back for shorter clubs. 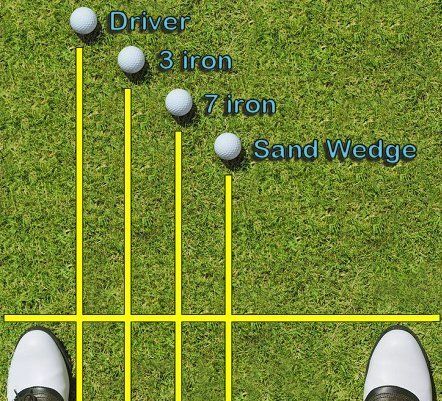 The distance of the ball from your feet is simply due to the different club lengths – longer clubs have longer shafts. So, keep your feet, hips and shoulders in line, head up and stay relaxed.